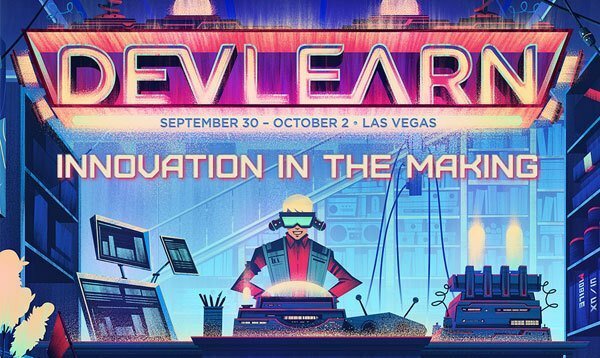 I have been to a few DevLearn before, but this year’s event was huge – everything right from the keynotes, the sessions, the pre-conference workshops, demo-fest, the expo et al. Late in September and early in October I made my way to the MGM Grand in Las Vegas NV along with 2800 other learning, eLearning, and Training and Development enthusiasts for the eLearning Guild’s DevLearn 2015. The buzz is this was the biggest DevLearn ever – I would not be surprised if that were true. The mobile learning workshop looked interesting, but a careful look at the agenda gave me the sense that this was targeted at those getting started with mLearning – a stage we have comfortably crossed at eNyota. I, thus, chose to focus on the Agile Project Management workshop and I’m glad I did. We have already adopted Agile in many of our software development projects, but given the volume of eLearning and mLearning projects we handle I had a lot of questions on how an Agile approach would fit in there. I got a wealth of information – so much so that I feel a separate article on the topic is warranted. The theme of the conference this year was “Innovation in the making” – a rather neat way to showcase the various innovative approaches organizations were taking to eLearning and also to make the point that this coming together of so many curious minds could lead to some innovative thinking too. The keynotes were picked to represent the theme. My favorite talk (act?) was the Opening Keynote from David Pogue. Pogue is the Host, NOVA ScienceNow and Founder & Columnist, Yahoo! Tech. He spoke about “Learning Disrupted: The Unrecognizable New World of Tech and Culture”. In a word the keynote was “Memorable”. I think it set the perfect tone for DevLearn. The key emphasis was how the lives and actions of people of all ages, and culture were being impacted by technology and extending that impact into learning. Hapifork, a smart fork which gives you a reminder to eat slowly by tracking the movement of your hand to your mouth. Wearable devices for health data tracking from a slew of vendors including Apple, Google, and Microsoft, and contact lenses with chips inside them to gather data about your blood sugar. Research Kit, an open source framework from Apple whereby health and medical data from so many wearable devices can be combined to give trends across the population. A privacy nightmare, but an awesome example of how big data can help change the face of personal and community-level healthcare. In an amazing example, the impact of stress on asthma was shown by looking at data from patients in New York/New Jersey! The direct linkages to learning were few, but the overall message was loud and clear – mobile, IoT, Big Data, and other technologies are changing rapidly and are invading every sphere of our life. The world of eLearning cannot be immune to this disruption – to be successful we will have to embrace this change. David’s sense of humor had the audience in splits for most of the keynote that ended with him singing at the piano! It was quite a keynote and one I will not forget in a hurry. This keynote will be a tough one to top for the eLearning Guild. I also liked the other keynote on “Curiosity, Discovery & Learning” by one-half of the MythBusters team, Adam Savage. Adam is quite the showman, but perhaps we were all drained by the first keynote to get quite so completely hooked! Using mobile and xAPI to make on the job learning workable. The DevLearn Hyperdrive Showcase, where the top 3 results from previous days demos were showcased. Showcase of how video could be used easily to train distributed workers. There was quite a lot of talk about xAPI – support seems to be growing and it’s worth following closely. Another theme I heard time and again was that the mobile device is going to be a gateway to link all the various groups of learning related technologies. While we have been satisfied with running our eLearning courses on tablets for a while now, clearly this is not going to be sufficient. The mobile devices and true mobility has the potential to make our learning so much more effective and to unshackle its delivery, consumption, and traceability. There’s another article right there – the mobile learning lessons from DevLearn! Then there is the Cloud – a clear lesson from DevLearn is that the days of the large Learning Management Systems secured behind the corporate firewalls are slowly but surely coming to an end. Learning is jumping the firewall and getting delivered anytime and anywhere leveraging the public and private cloud. This may also herald the eventual EOL of many of the ways of learning we have held dear for so long. On a more personal level, I was happy to see the rate at which new products and systems are getting launched. eNyota has its own skin in this game with our Learning Management System coming out early in 2016. Clearly there is competition out there but there is a play for those willing to adapt fast to this new mobile-first world. As I leave the bright and flashy lights of Vegas behind I think the future is bright too.